If you drive Highway 9, you’ll pass a number of small towns between Drumheller and the border with Saskatchewan. Well, “town” might be a bit of a misnomer. Many of these locations are little more than a dot on the map and they are just shadows of what they were a hundred years ago. On our way home a couple of days later, we made sure to pull off onto the side road and drive into Chinook. We stopped and snapped what we call a “documentation photo” — nothing artistic, no real thought behind it other than capturing an image of a building that will disappear one day. With nary a second thought, I posted the image to Twitter. Before long, there was a Tweet from Jonathon Koch (@4gotten_alberta). Jonathon is one of those people I consider a good friend of DanOCan.com, despite not yet having met him in person. Anyway, Jonathon mentioned that the building was originally owned by the Cooley Brothers. With that nugget of information, I decided to do a little searching when I got home. Now, I am not going to attempt to tell the story of Len and John Cooley in great detail. Instead, I’ll encourage you to head over to raycooley.com and read it there, direct from the son of Len Cooley. Ray passed on in 2001 but his words live on. So, the Reader’s Digest version is this: In 1922, the Cooley brothers purchased a large livery stable and converted it into Cooley Brothers Garage, where they were agents/dealers for John Deere and the Ford Motor Company. In 1927, the Cooley Brothers opened a brand new custom designed building to house their operation. One of my favorite things about this hobby is when something as simple as an abandoned building leads you down a rabbit hole and allows you to uncover a story that you otherwise might never have known about. I’m really happy that — 91 years later — the Cooley Brothers garage still stands and their memory lives on. Do you have any buildings or locations that you have driven by multiple times but have yet to stop at? Is it still there or did you find “next time” turned into “never”? Let me know! 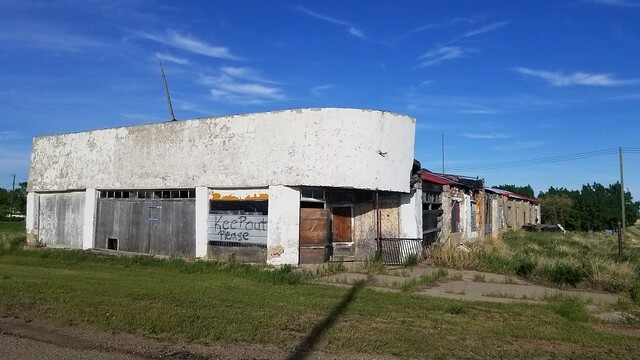 This entry was posted in History and tagged abandoned, Alberta, Canada, Chinook, Chinook Motors, Cooley Brothers, gas station, history. Bookmark the permalink. Awesome Dan! I have been researching this building as well, and unfortunately, I can’t seem to find much out about the Chinook garage after the Aitken Bros. sold out. If anyone knows the history of this garage since 1975, I’d love to hear from you! Thanks Jonathon. The information I got from you was most useful in putting together this write-up. I’d sure love to know more about its recent history as well, including what the condition of the interior is like. If you hear of anything, let us know. Thanks Dan – Your tweet from a few weeks ago got me thinking about the Chinook garage again. The info after about ’75 kind of dries up, but I’ll do some more poking around. I’ll let you know if I stumble across anything else. Safe travels this summer – maybe we’ll cross paths? That would be great. We’ll be out and about doing various trips and things all summer.